Children's Hospital Colorado once again has been ranked among the nation's top ten children's hospitals in the U.S. News & World Report 2012-13 Best Children's Hospitals rankings, now available online at www.usnews.com/childrenshospitals. Children's Colorado has been ranked in all ten specialties. 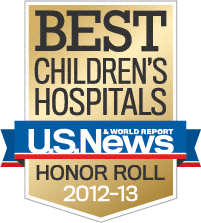 High rankings in a minimum of three specialties qualified Children's Hospital Colorado for the 2012-13 Best Children's Hospital Honor Roll, a distinction awarded to only 12 children's centers nationwide. Children's has been ranked a top children's hospital by U.S. News & World Report every year since the inception of its rankings edition in 1993. Five specialties were ranked among the top 10: Diabetes & Endocrinology (No. 4), Pulmonology (No. 6), Cancer (No. 8), Orthopedics (No. 9) and Gastroenterology (No. 10). The other specialties were ranked as follows: Neonatology (No. 18), Neurology & Neurosurgery (No. 19), Cardiology & Heart Surgery (No. 20), Urology (No. 38) and Nephrology (No. 45). "This is great news for all the children we care for who continue to have access to the nation's top doctors and hospital professionals in their own communities," said Jim Shmerling, DHA, FACHE, president and CEO, Children's Colorado. "This ranking is just one indicator of the excellent patient care and the pioneering research conducted here. Our greatest recognition comes from patients, families and colleagues who consistently compliment and value the outstanding pediatric healthcare we provide." "Children's Hospital Colorado deserves high praise for its accomplishments," said Health Rankings Editor Avery Comarow. "Its dedication and expertise reach across multiple specialties, as shown by its Honor Roll listing." The rankings feature 50 hospitals in each of 10 pediatric specialties: cancer, cardiology and heart surgery, diabetes and endocrinology, gastroenterology, neonatology, nephrology, neurology and neurosurgery, orthopedics, pulmonology, and urology. Eighty hospitals across the country ranked in one or more specialties. For families of sick children, Best Children's Hospitals provides unparalleled quality-related information in addition to rankings, including survival rates, adequacy of nurse staffing, procedure volume, and much more. Since their debut, the rankings have put an increasing emphasis on data that directly reflect hospitals' performance over the opinions of physicians. This year, U.S. News surveyed 178 pediatric centers to obtain hard data such as availability of key resources and ability to prevent complications and infections. The hospital survey made up 75 percent of the rankings. A separate reputational survey in which 1,500 pediatric specialists-150 in each specialty-were asked where they would send the sickest children in their specialty made up the remaining 25 percent.